Art in the Park is open to both professional and amateur artists. Original works in painting, graphics, sculpture, photography, wood, glass, metals, printmaking, ceramics, jewelry and mixed media are eligible. NO kit crafts are allowed. Artists may only exhibit in the medium(s) in which they are juried. 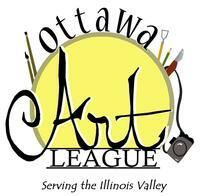 The Ottawa Art League reserves the right to refuse exhibition of work not consistent with submitted applications. Each artist is required to be in attendance during show hours. The artist is required to display their original artwork. Prints should be signed, numbered and marked limited edition. Reproductions must be marked as such and should not comprise more than 25% of the display. All work displayed for sale should have prices clearly marked. All sales tax reporting will be the responsibility of the artist. Ottawa City Tax is 7%. Illinois. This is held in conjunction with Ottawa's Riverfest Celebration; there is a large parade on Sunday. Booth space is approximately 10 x 10. All booths are on grass facing the sidewalk. Artists will be responsible for providing their own tents and displays. Set-up is from 7am-9am, Aug 3, tents may be left up over night. Non-refundable Jury fee $5. This fee is waved for returning artists. Judging starts at 10 am and will be based on overall quality of the artwork & exhibit. Your display must be finished to be included in judging. Applications must be postmarked by July 3rd, 2019.